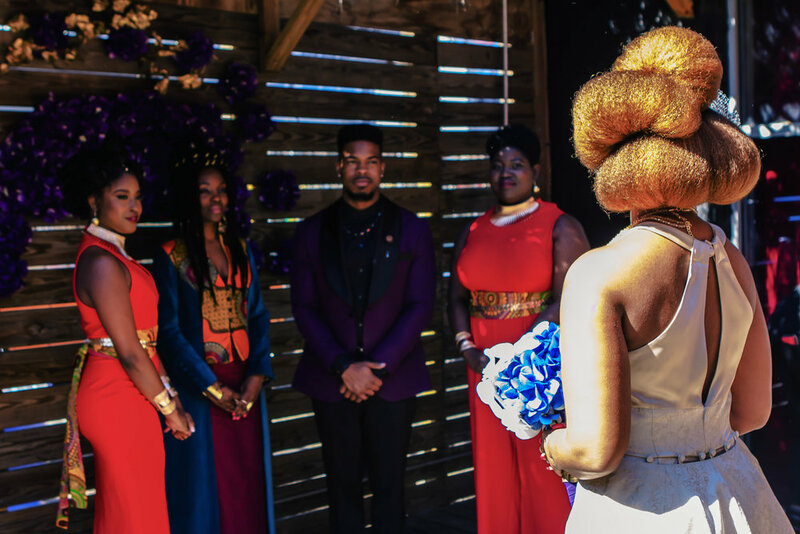 An Intimate Wakandan Wedding - Inspired by "The Black Panther." Before I delve into the details of my vision, congratulations are in order! 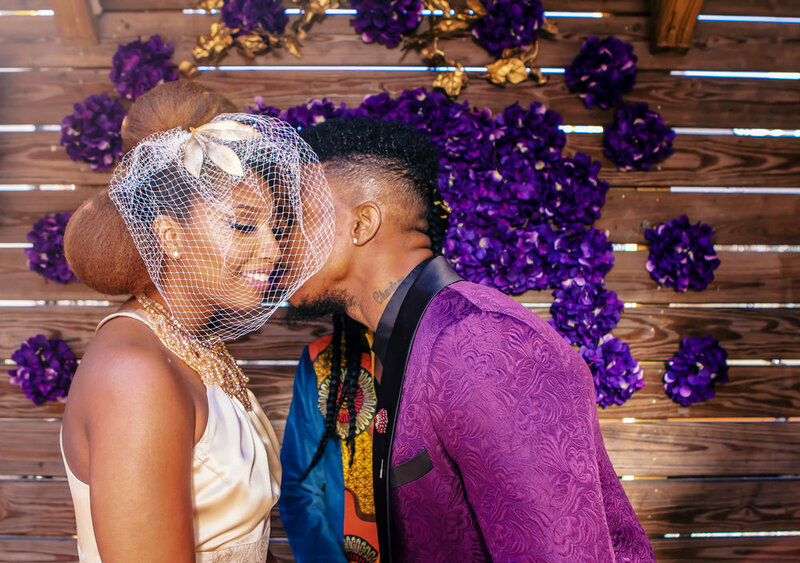 Our model bride and groom, Courtney (Curls and Couture) and Ty are newly engaged to be married - cutest couple ever. 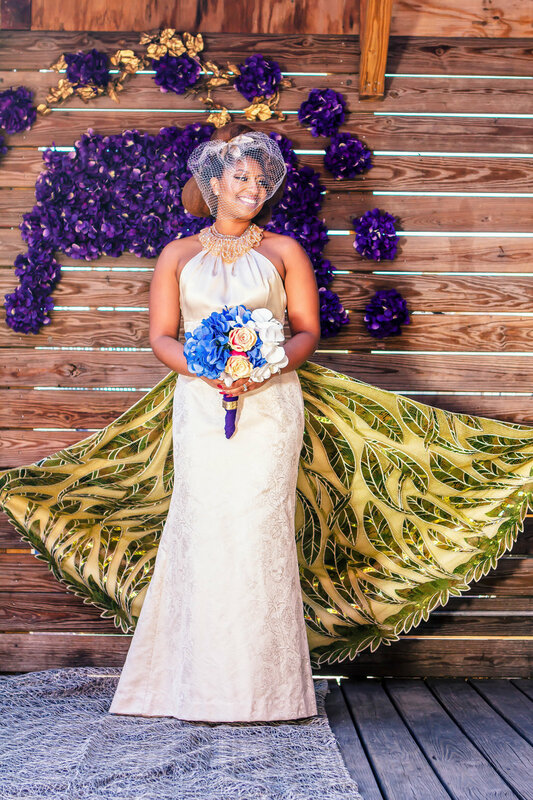 As a wedding stylist, I love bringing my clients' concepts to life. Often times, when thinking of a themed wedding, particularly a super hero, it can come across like a costume rather than an influence. 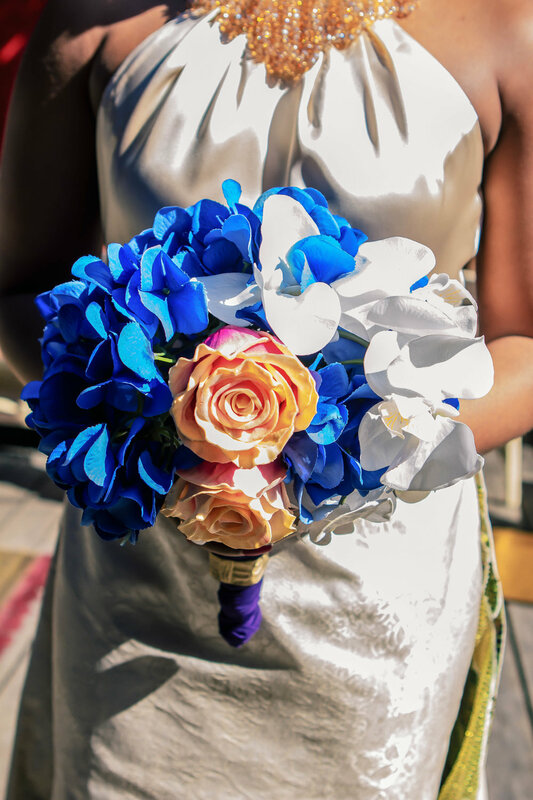 My goal is to seamlessly infuse the inspiration, making it as realistic as possible without losing the wedding flair. 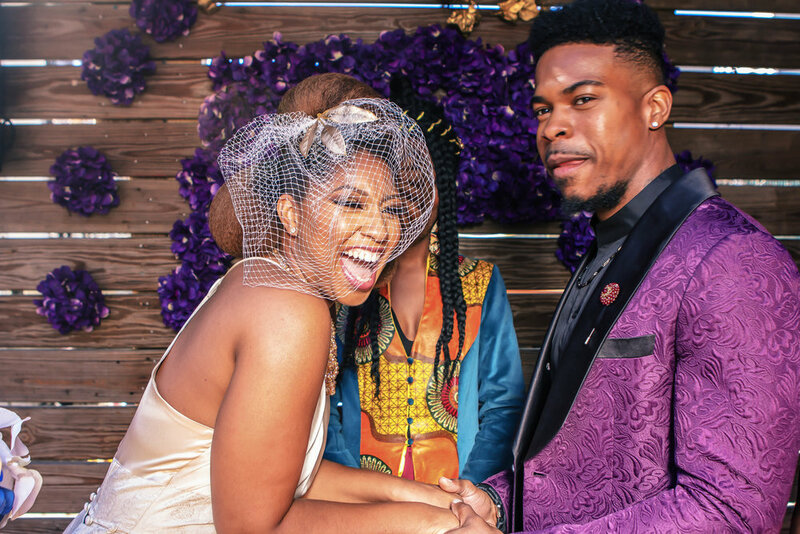 During the ceremony, the groom awaited his bride in a regal purple jacket designed by Garcon Couture. I added a subtle, black and silver ("vibranium") chain as a head nod to T'Challa's Black Panther necklace. 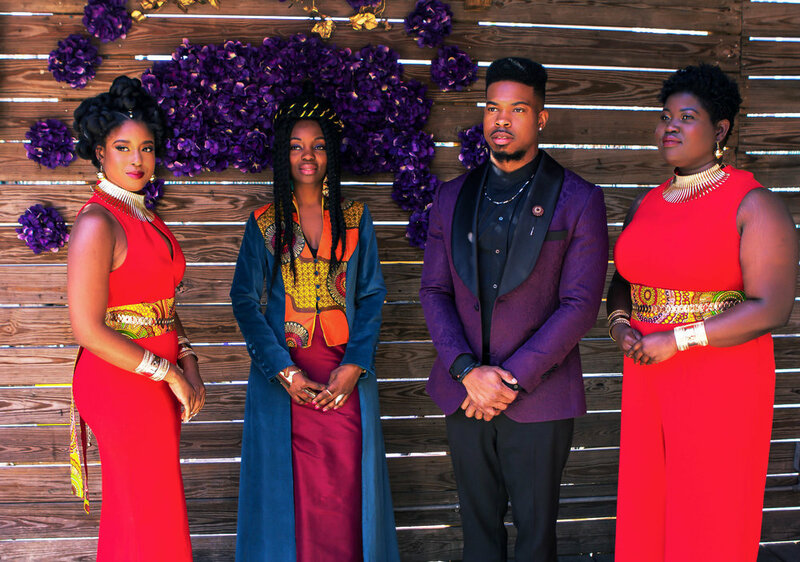 Inspired by Okoye and the Dora Milaje's tribal gear, I dressed the party in architectural red pieces with Ankara sashes and added gold accessories. 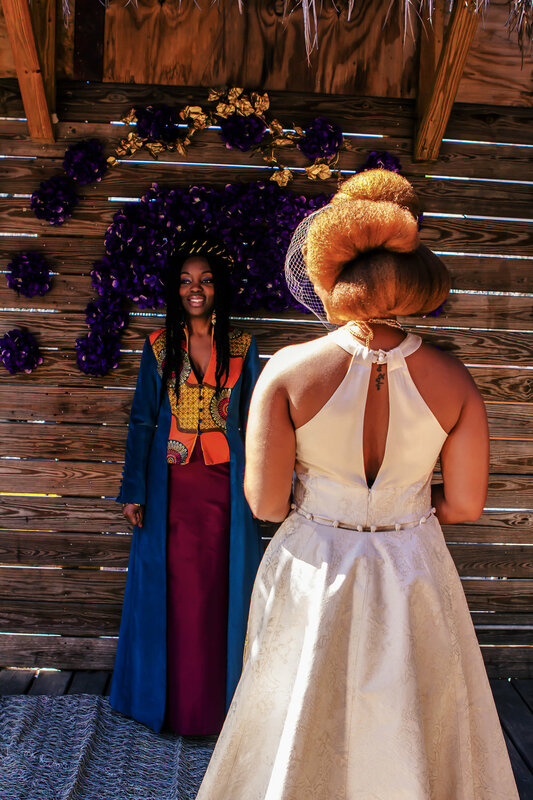 The wedding officiant was adorned in Kimera Design, emulating the presence of a modern day, female Zuri. 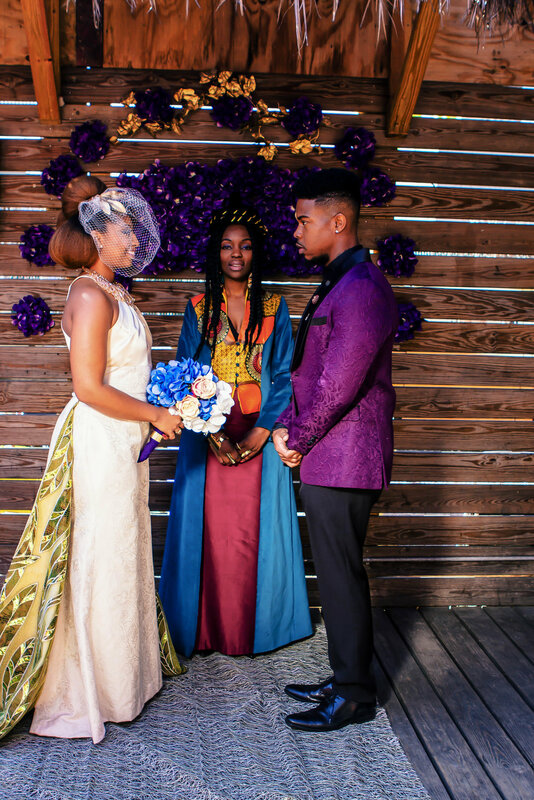 A Wakandan bride would have to go custom for such a special day, so I styled her in a regal Kimera gown that had a luxurious Nigerian fabric inserted underneath her detachable train. After the exchange of vows, the only thing left to do is, PARTY! Energized by the Afro-Futuristic fashions of the Wakandans, an outfit change was necessary including tribal stones and a Gele. 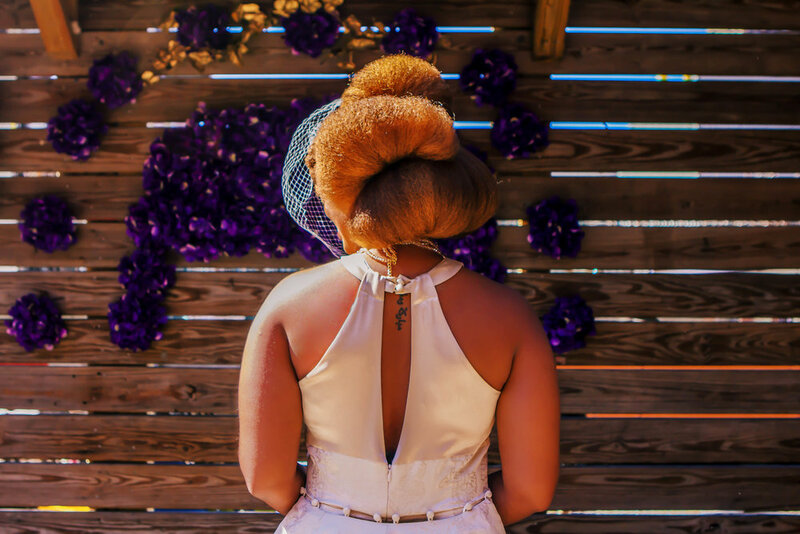 Though traditionally worn more fitted, covering the hair, we took great pride in showcasing the bride's royal mane. 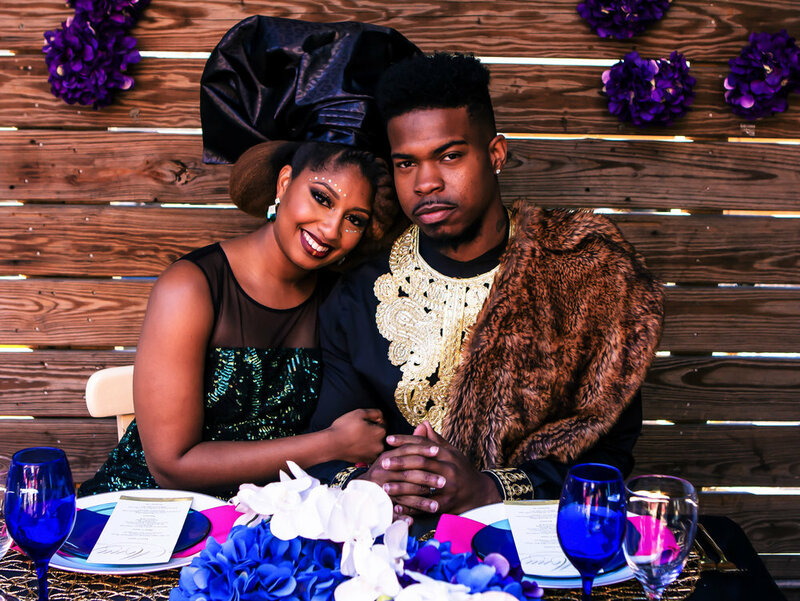 I thoroughly enjoyed putting this Wakandan Wedding interpretation together. From the glorious hair stylings (Natural Hollywood), to the stunning makeup (Manniefique and Zarielle), the vibrant decor and table settings (Designed by Lu), the breath taking photography (Moments by Marie) and so many more people - I could not have done it without such a spectacular team of talented artists (see credits below). Enjoy the full photo gallery. Wakanda Forever!